Christoph's Clouded Yellow, Желтушка зеленокудрая. The species is distributed in Transcaucasia, Turkey, and Iran. Armenia is inhabited by subspecies C. c. tkatschukovi O. Bang-Haas, 1936. 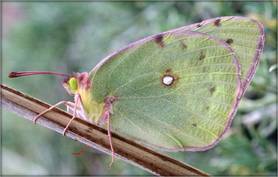 In Armenia the Christoph's Clouded Yellow inhabits mostly Southern Armenia where occupies calcareous grasslands dominated by Onobrychis cornuta (which is the only host plant of the species) in elevation range between 1000 and 2200 m a.s.l. The flight period is from late May till end of July. The species is uncommon or ever rare within typical habitat. The population trend of the species demonstrates moderate decline (p>0.05). The species is a habitat specialist and there are several threats which can affect its population. At first, overgrazing in the habitats of the species results in general habitat degradation and although it cannot affect the population of the host plant, but results in severe decline of nectar suppliers. At second the trade of this high demanding species can have the negative influence on its population. And eventually the irresponsible habit of local people who often burns the bushes of Onobrychis cornuta for local fire results in decline of host plant's population. The species is not included in the Global and European Red Lists, as well as is not considered under CITES and Bern conventions. However it was included in the Red Book of Animals of Armenia as Vulnerable. The distribution range of the species is covered by Khosrov Forest State Reserve and Gnishik Protected Landscape as well as by Emerald Sites Khosrov Forest and Gnishik. Also the species is distributed in Gnishik and Ourtsadzor﻿﻿ Prime Butterfly Areas. The proposed conservation measures include better management of the pasturelands, controlling the trade of the species, and wide-scale education campaign aimed at improved behavior of local people.